Halloween time is practically overflowing with fun occasions. Class parties, halloween parades, parties with friends, trunk or treat activities and of course trick-or-treat night on October 31st. All that fun seems also to come with candy. Lots of candy. So much candy. Not to mention popcorn balls and cupcakes and caramel apples. Whoa. That is a lot of sweets. With families trying to make more health conscious and wholesome choices, it’s nice to have some inexpensive alternatives to candy when it’s time to pass around treats and prizes. Here are some of our favorite kid-approved non-candy Halloween treats, for your next party or for passing out at your home. Yes, we even pass these out at our door on Halloween, and no, we’ve never been egged or toilet papered. In fact, I think most little ghosts and witches are delighted with something out of the ordinary. Let’s start with stickers. All kids love stickers. Puffy, shiny, or glittery, and in all those fun halloween shapes. 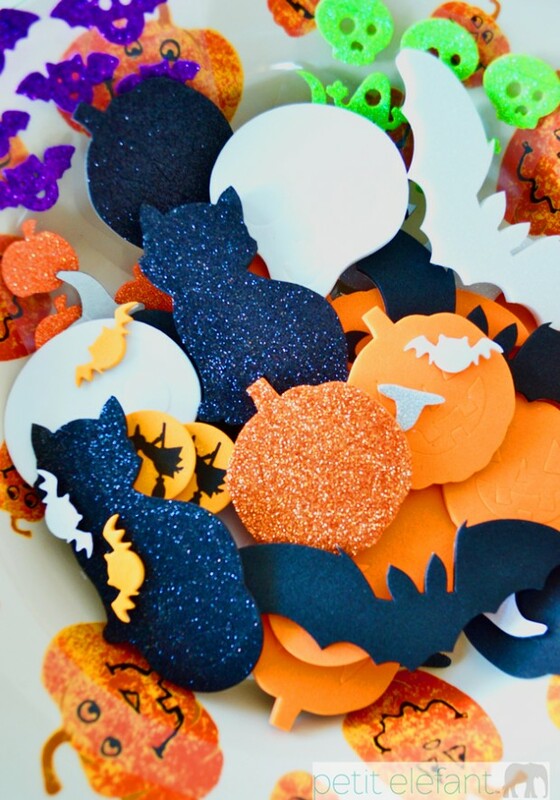 A mass of stickers in your treat bowl, or a bundle of foam stickers in a goody bag will impress all your little goblins. You’ll be impressed that these are totally budget-friendly. Bouncy balls are positively irresistible to any child. They also look pretty fantastic, with all their bright colors and patterns, piled into a big dish all ready for those goody bags. One thing to note here is that younger children could mistake them for candy. So, set them straight from the first. I imagine they taste pretty nasty, so one small lick is likely all it would take to discourage putting the whole thing in one’s mouth. But, to be safe, make it clear it’s a toy or reserve for older kids. 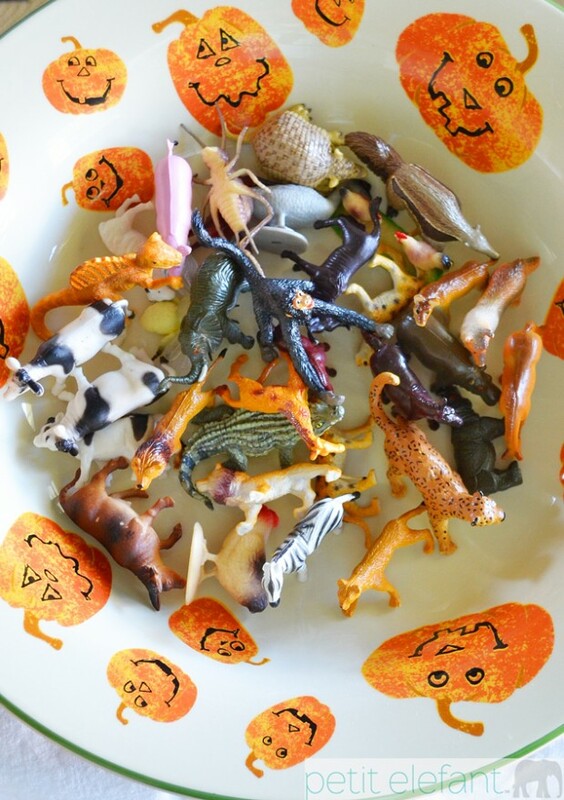 Mini animals like these make great prizes for both boys and girls, and can be purchased in bulk quantities. 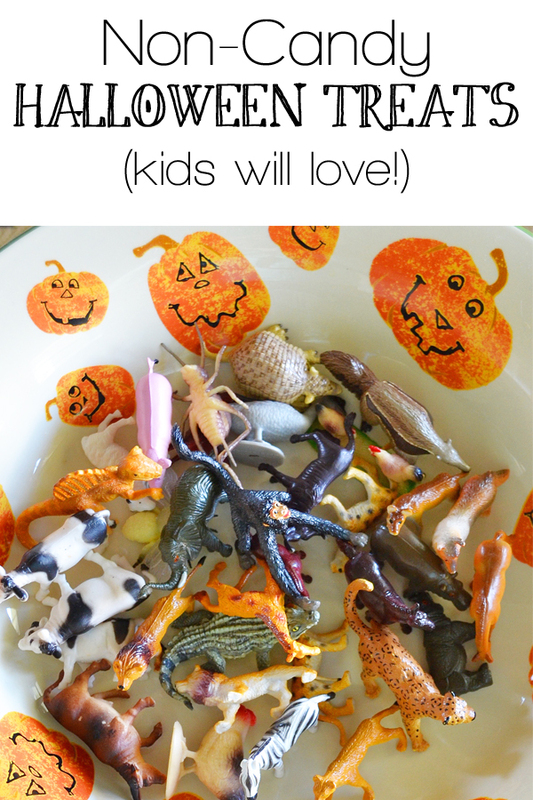 Go for dinosaurs, farm animals, or safari animals. I love that these appeal universally to boys and girls, and wide range of ages. Glow sticks, glow rings, glow necklaces—glow anything is sure to make yours the cool house on All Halllow’s Eve. Who could resist a bowl full of glowing colors to choose from? Plus, they can wear their new prize all evening. Mini cowboys are tons of fun, too. You know the kind, like those classic green army guys? 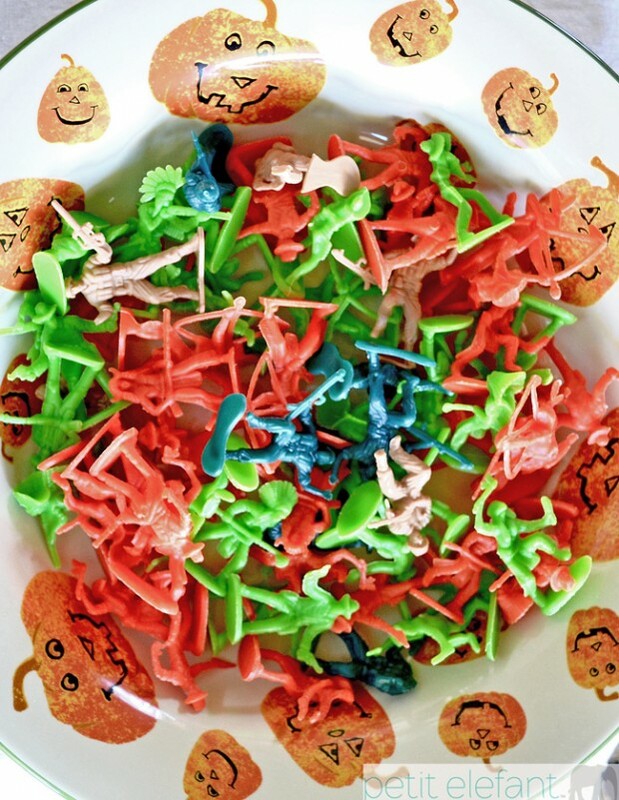 Whether piled into your bowl of goodies or packed up in small quantities as party favors or prizes, and whether soldiers, cowboys or knights, these will easily win the non-candy battle. If giving out something edible is still important to your household, it’s easy to find mini packages of pretzels, crackers, even popcorn marketed especially for Halloween. Whatever you choose, rest assured that in our years of going the non-candy route with trick-or-treaters, we’ve yet to experience any grumbling, complaining or vandalism. Only smiles from our little guests and supportive comments from parents. Happy haunting to you!